A Notification for Direct recruitment of Postal Assistants/Sorting Assistants is to be issued on 11-08-2012 in leading news papers in English/Hindi. The cost of Application form is Rs. 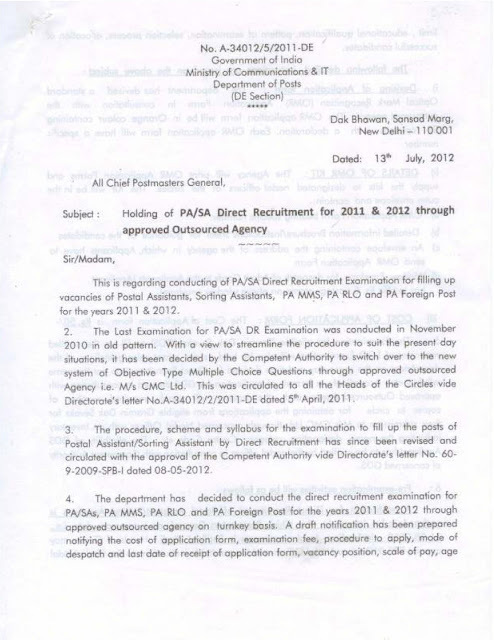 50/- sale of Application forms will commence from 11-08-2012 and closes by 25-09-2012 in all Head post offices. Examination fee Rs. 200/- is to be paid in ACG 67/UCR. The Examination for eligible Gramin Dak Sevaks (GDS) to fill up the unfilled vacancies of LGO Examination will also be held as per extant Rules/guidelines of the department on the same day and time decided for Direct Recruitment as per the same syllabus etc. 4. No documents will be sent at the time of application. Documents will be verified after aptitude test. Only the candidates having minimum percentage of marks will be called for Aptitude Test. Marks secured in 10+2 will not be counted for Final Merit Selection. The total duration of the Aptitude Test will be two hours. marks by SC/ST candidates and 9 marks by OBC candidates in each part. some figures and letters each carrying equal marks. candidates and 37% marks by OBC candidates. minimum marks in 10+2 or class shall be called for the Aptitude test'. given while preparing the merit list. (iii). Candidates numbering five times the number of vacancies in each category i.e. Test based on the marks secured by them in the Aptitude test. 8. Allocation of Division. : The allocation of Division to the candidates will be given in order of their Merit in the aptitude Test and vacancy position in the Division.